Boys will be boys when it comes to the dark and mysterious. I suppose that means one thing for the yesterdays of my life as it compares to the youth of today. The “dark and mysterious” of growing up in Danville, Illinois in the 70s and 80s (and in a tougher neighborhood, no less) had nothing to do with the dangers of influential and mind-numbing video games, texting (or “sexting”), or anything else that creates the obese and literarily illiterates of our current society. We were outside all summer long. Sure, it was a little rough sometimes. Sometimes it consisted of fistfights, but as I recollect, those scuffles produced respect as opposed to what we may very well expect from youth today — grudges ending at the barrel of a gun. About the most “dark and mysterious” summer day I can remember involved me, my brother, and another kid from the neighborhood throwing our bikes onto a flatbed railcar at a candy company depot near our house, hopping aboard, and riding it about 30 miles west to Tolono, Illinois where we rode our bikes around until we caught another train going another 15 miles north to Champaign-Urbana. If I remember correctly, we ended up getting a ride back with our friend’s uncle who was a student at the University of Illinois. Of course I would never let one of my kids do something like that…like ever…but even as it was dark and mysterious so to speak, it was a dangerousness that was met with a beautiful innocence, not born of the negative connotation (and unfortunately the realism that goes along with it) that accompanies the terms “dark” or “mysterious” today. The darkness and its mysterious horizon that day were coaxed to life by the beckoning summer freedom and unmasked by brotherly adventure. Even the workers who walked the rail line and waved to us, warning us to be careful, reminding us (as if they had been sent by our mothers) to be back before supper, even they seemed to know that this journey, however small, would shape us for the better. 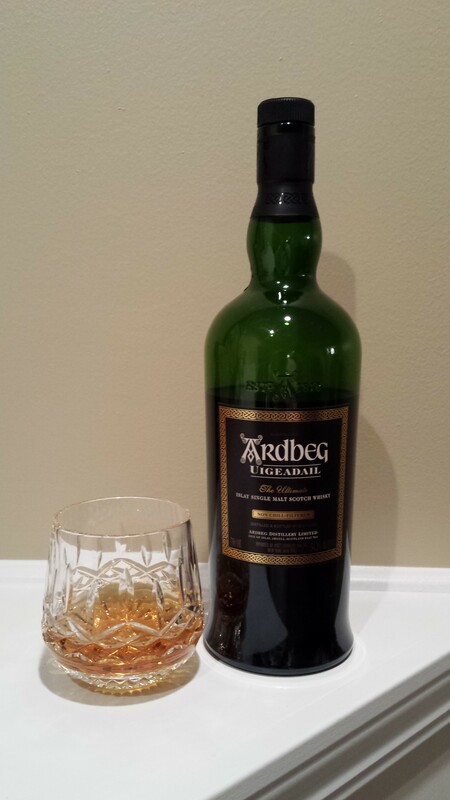 The Ardbeg Uigeadail will make you a better whisky drinker. It is a dark and mysterious water that urges you to reconsider the adventure that lies just beyond the horizon of the smokiest whiskies the Scottish isles have to offer. The nose, at first, is a firm challenge of peat smoke. It meets you like a gritty neighborhood kid in the alley behind your house, giving you a shoulder shove, warning you that you’d better toughen up and get ready for what’s coming. But in that warning is a cherried temptation that makes you warm. It urges that you can take this kid, and even if you really can’t, you should give it try. The palate is salty. It tells you that you didn’t get away without a little blood in your mouth, nevertheless, you were tested and have a new best friend. The victory is indeed sweet. It carries you beyond the saltiness to hints of sherry and dried fruits, perhaps apricots. The finish is long and somewhat rough, but not unpleasant, just like a flatbed railcar ride clicking and clacking past open fields where a farmer is burning flora-filled patches and waving his hat to you from atop the John Deer. It is inviting. It reminds you that this is what “dark and mysterious” can be. Ah yes! The (mis)adventures of youth. I grew up in South Philly, and much like yourself, I pretty much had the run of the town. I definitely got into my share of trouble (I was a bit of a delinquent at times), and if my kids pulled that crap, I doubt they would live to tell the tale. You brought back some fond (and sometimes scary) memories, but I think you were a bit harsh to the youth of today. Most of their faults are our own fault for being overprotective and overindulgent. Also, many people have a tendency to blame others for their kids shortcomings rather than taking the blame themselves or the actual children. We just need to be tougher parents. We’re doing them no favors by protecting them too much. Re: the Uigeadail, I love this stuff! Classic Ardbeg with a twist. As usual, a fantastic review! I whole-heartedly agree that the youth are a product of “us.” Thanks for the note!